2011 started off a bit slowly. The piecing of FOTY 2010 took me longer than planned and that got me off schedule a bit. It came out really well, though, so I am glad I took the time. I read 55 books this year. Of the 55 I read, 20 of them were quilt, bag or creativity related. Fabric of the Year 2010 was at the San Jose Museum of Quilts and Textiles from August 14-October 16, 2011. What a thrill to have a quilt in a museum show! Completed means to me that they are now usable and can in no way be considered to have anything left to stitch. 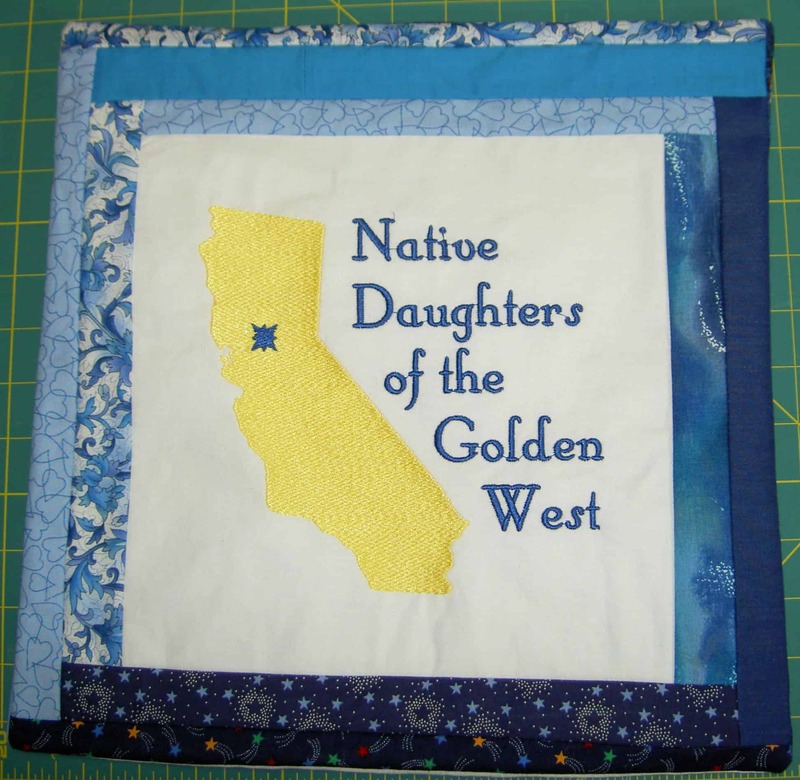 ~316 blog posts related to quiltmaking, design or creativity. Original Bullseye: decided, with help of my fabulous readers just to put a simple black border on and bind in black. Needs border, back and binding. The Tarts Come to Tea: quilting in process. Needs quilting completed, embroidery and embellishment, binding and sleeve. Here is my list of UFOs. 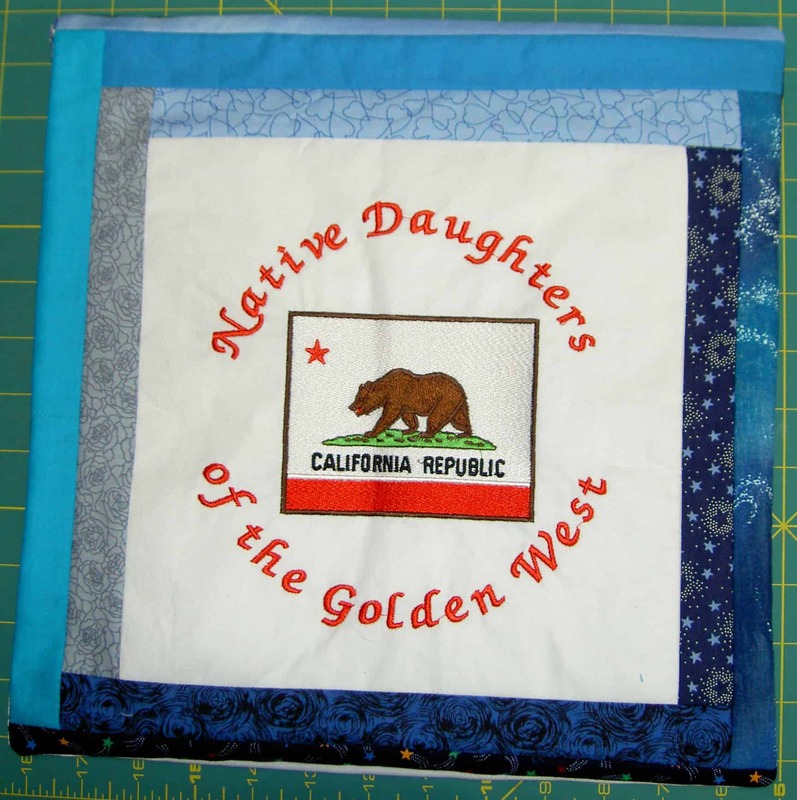 You can see many of them over at Artquiltmaker.com or look at the links I have provided.As mentioned last year, this list in no way implies that I will discontinue starting new projects or finish any of these. Flowering Snowballs/Cross Block quilt: I not worked on this quilt at all year and have finished the center blocks. The side and corner blocks are drawn out on EQ6. I worried on and off about how to keep the blocks from fraying after I square them up. 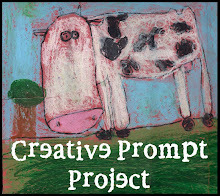 Got some good ideas from fabulous readers after my December 20, 2008 post! No progress in 2010 or 2011. Garden from Pamela Allen class: needs hand embroidery and embellishment. Worked on it in the 2009 Pamela Allen class and it is much improved. Needs quilting, embellishment and binding. Laura Wasilowski Flower Garden: started in the Laura Wasilowski class CQFA held in July 2007: needs machine quilting, hand embroidery and embellishment. No progress in 2008. He Tried to Make it Up to Her: needs back and to be quilted. This is probably a quilt I will want to quilt myself. TFQ has dug out a number of quilts, but I don’t know if this was one of them. No progress in 2008. See: started in a David Walker class. Needs fusing, satin stitching around fused pieces and quilting. No progress in 2009, but I did think about it alot. Spiderweb: foundation pieced project, still piecing. Pattern for the border blocks created, need to print on paper piecing paper and piece. I also think I may have made too many blocks and may make this into two quilts. 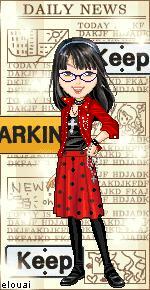 Aside from collecting more strips, no progress 2008-2010. Under the Sea: brown piece from April 2009 Pamela Allen class with CQFA. Needs machine quilting, hand embellishment and finishing. 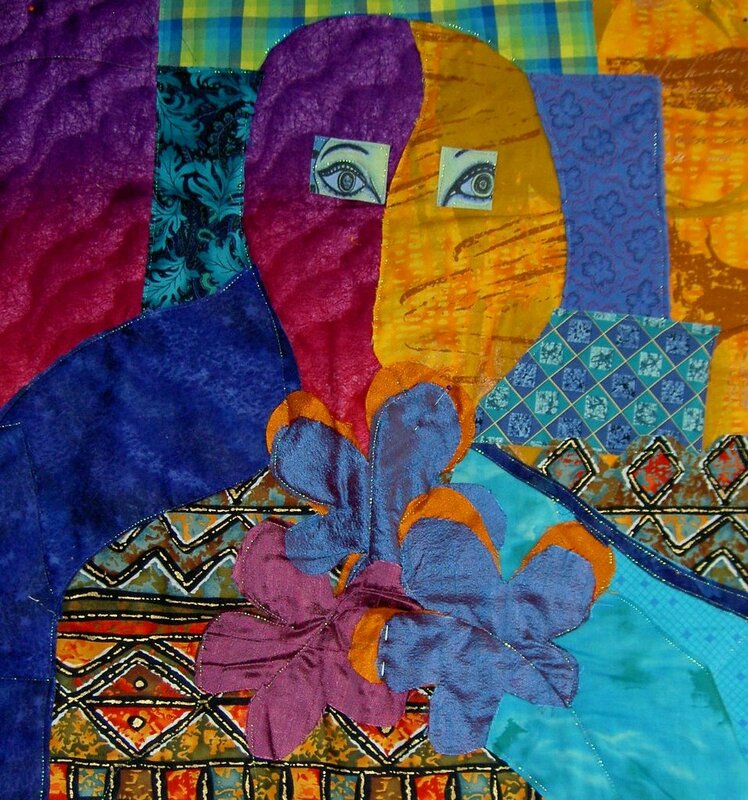 Women’s Work 2: In 2009, I said that this quilt “needs focus.” Was inspired and have the design. No progress 2009-2010, except for finding my drawing and making a file. 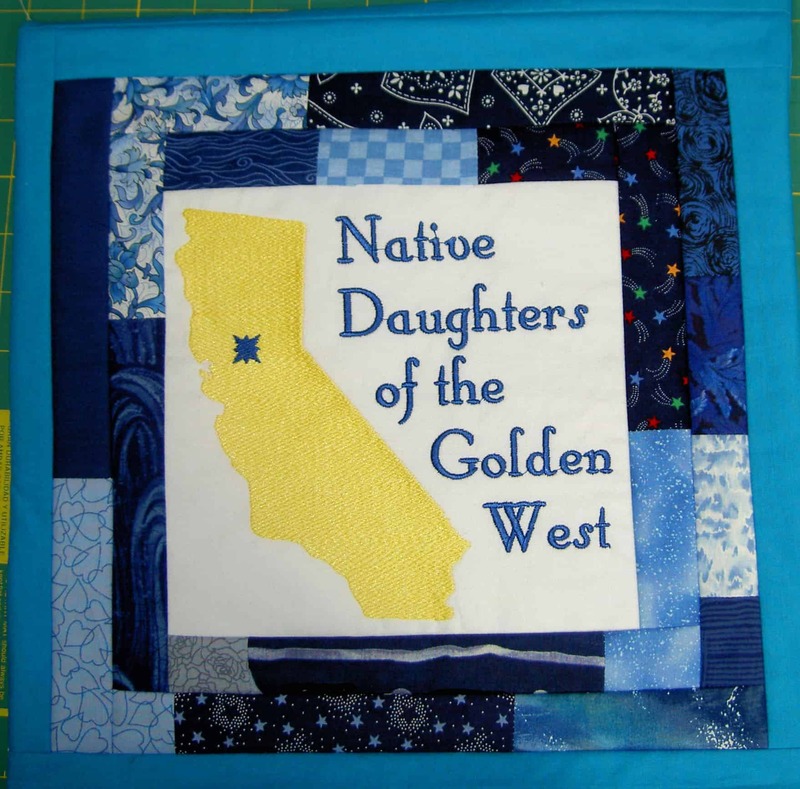 Here are the quilts and projects I am thinking about. Some are on the list from last year. In some cases I have purchased fabric, but no sewing has been done, so they are not yet considered UFOs. Bathroom ‘quilt’ out of heavy clear plastic. I want to make pockets that I can put interesting things in that won’t get waterlogged. I also think the stitching would be an interesting addition to the piece. I also saw a tallish tote bag with many pockets that is similar to what I have been thinking for this quilt, so perhaps I will do another tote instead. Blue Rectangle Project-Blue monochromatic quilt with the 2.5″x4.5″ blue rectangles I have been cutting. Colorblocks 4 with silks: I want to use this pattern (or something like it) from Sandy Bonsib; silk fab will use silk fabric with a luscious sheen instead of the regular cottons. Background will be black cotton sateen again. What’s been holding me up? Backing all the silk. I have the backing and just can’t bring myself to do it. Barsha told me to skip the backing and just make the quilt without it. Can’t decide if the project has new life or not. Definitely not on the top of the list. Dot quilt with inset circles a la Ruth McDowell: more uses for dots and a good exercise in piecing. The Twinkle quilt shown in the January 2009 issue of Quilting Arts magazine is similar and renewed my interest in this design. Took a Dale Fleming class in April of 2010 and learned another way to make circles. 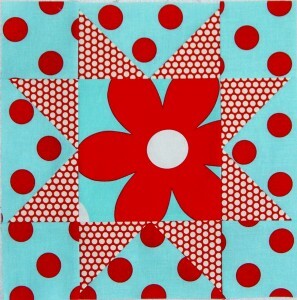 Feathered Star dot quilt from Summer 2007 issue of Quilts & More: more use for dots. I thought I would get to this after making the Pineapple, but the Pineapple is still not complete, so this this dot quilt has not been started. Interlocking triangles #4: love the technique and have at least one, if not two, idea[s] for more quilts using this technique. Garden Quilt: I have been collecting photos and patterns of interesting flowers for years and have always wanted to make some kind of garden or flower quilt. It will probably be something like The Tarts Come to Tea. Need to finish the Tarts first before starting the same kind of project. Now I can use the Soft Fuse for this quilt. Jack’s Chain: I saw a quilt of this pattern years and years ago and have always wanted to make one. 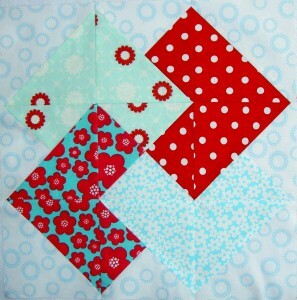 Probably at least a partial hand piecing project after the Flowering Snowball (Cross Blocks quilt). 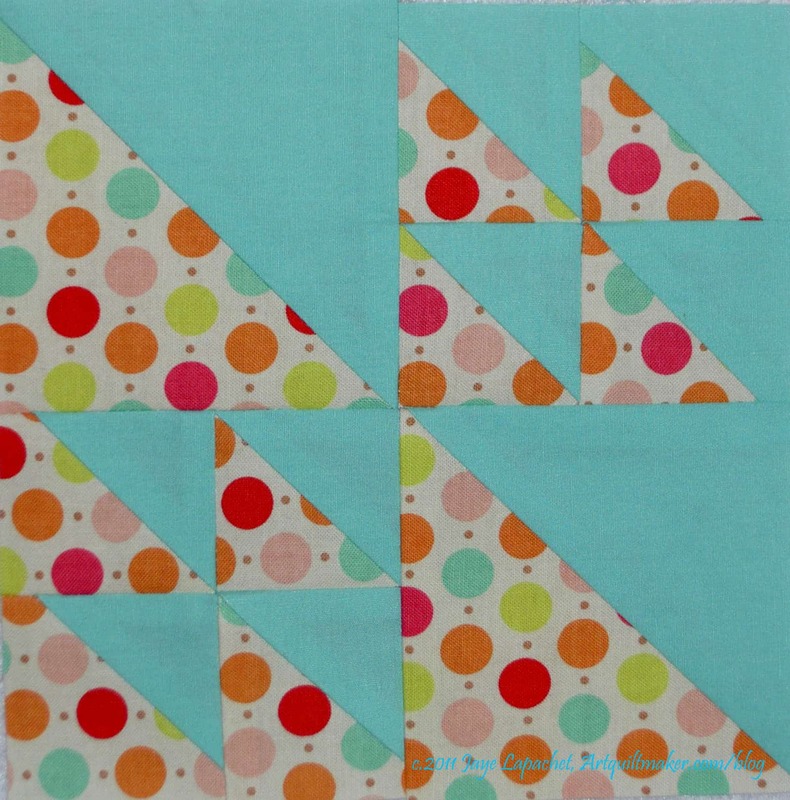 I am more confident seeing how Liz Porter and Marianne Fons handled equilateral triangles. I also have that new ruler to use. I could, additionally, decide on a size and start piecing nine patches. 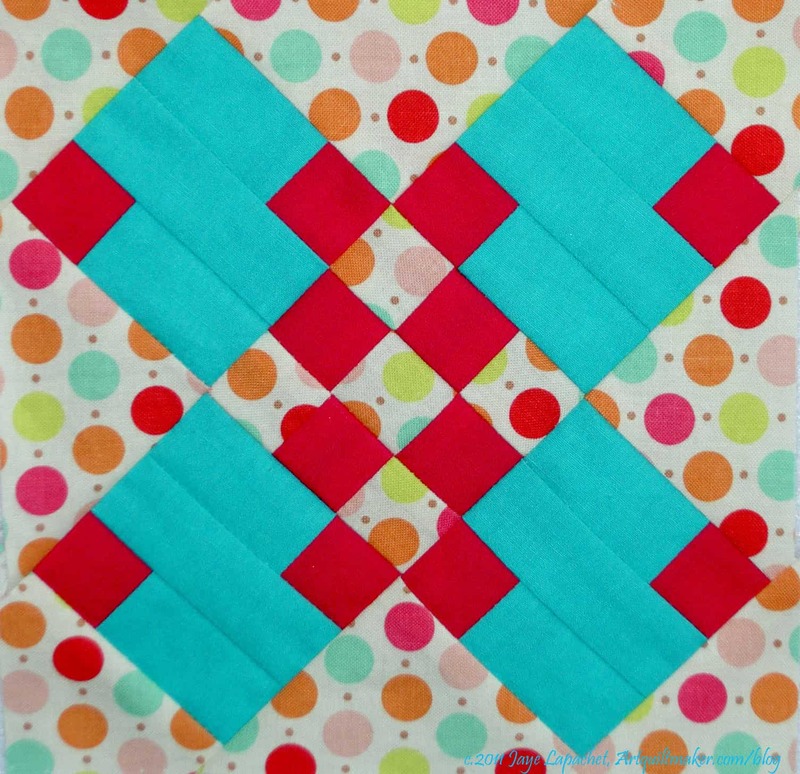 I saw a quilt at PIQF 2011 that used other pieced blocks instead of 9 patches, which was quite intriguing. Liesl tote/backpack: have fabric and pattern and after hearing her interview with Jennifer at CraftSanity, I also have the confidence. Some kind of pink quilt with all the pink fabric I have still been buying. I have begun cutting 2.5″x4.5″ rectangles of pink fabrics that cross my cutting table, so it will probably be some kind of rectangle quilt. This is also a new category. I decided to be upfront about the projects I got rid of. 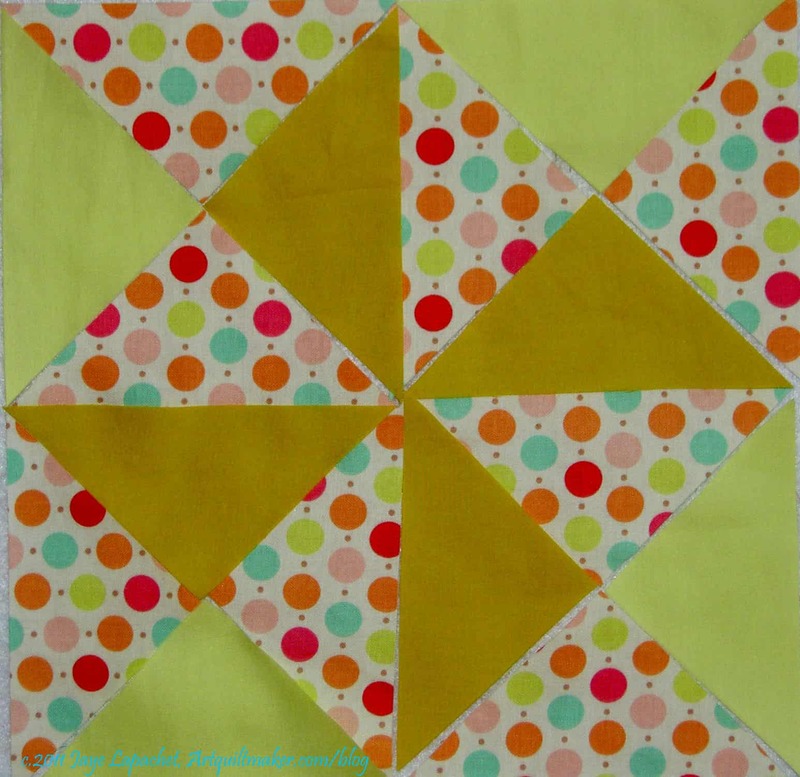 Dot Pineapple quilt abandoned in 2011: I just can’t deal with the different sized blocks. I feel terrible about this one, but think that I will start it over and be better about tracking the size of each block. QA Challenge Quilt: I needed to fuse the parts and rubber stamp the words, but I just wasn’t feeling the love. I have other things to do, so off it goes. Happy New Year and Happy 2012 Sewing! what happened to San Bruno stars 3? I just discovered a really cool thing to do to abandoned blocks, make them into potholders. I made 17 or 18 of them for Christmas.